Read the next instalment of volunteer Kay Bryant’s discoveries about sisters at GSA in the late 19th and early 20th century! Elma MacDonald was for many years the editor of the Monklands Heritage Society Magazine, “The Raddle.” Her interest in a glass mosaic panel in St Augustine’s Church in Langloan, Coatbridge, by Jessie McGeehan, led her to find out more about the artist and her family and to write about it in the journal of 2007. Elma’s research helped provide much of the missing information about Sister Callista and her work. Sadly, Sister Campion had no such champion, and I could not find anything more about her. The McGeehan patriarch was Patrick, (1847-1924) a grocer and spirit dealer in Black Street, Rawyards, Airdrie who later became a carriage hirer. Very involved in the local church and community, he was a talented musician and artist who had a painting accepted by the Royal Scottish Academy in 1879. Patrick obviously encouraged his children’s interest in art and in March 1888, his eldest daughter Jessie Mary McGeehan (1872-1950) enrolled at the Glasgow School of Art, aged just fifteen. In September, she was joined by two of her younger sisters, Annie Louise (Aniza) (1874-1962) then thirteen, and nine year old Mary Catherine (1877-1960). Although they seem very young to be at the Art School, there were other students of this age listed on the register at the time, often attending with older family members. Jessie and Aniza continued to attend the school until 1895, but after the 1888-1889 session, Mary’s name does not appear in the records. Instead, Mary entered the Order of Sisters of Notre Dame in September 1904, taking her final vows in 1914 and becoming Sister Callista. Another McGeehan sister, Lizzie (Elizabeth) (1882-1918) also attended the Art School from 1902. A watercolour artist, Lizzie died of pneumonia at the end of the war. 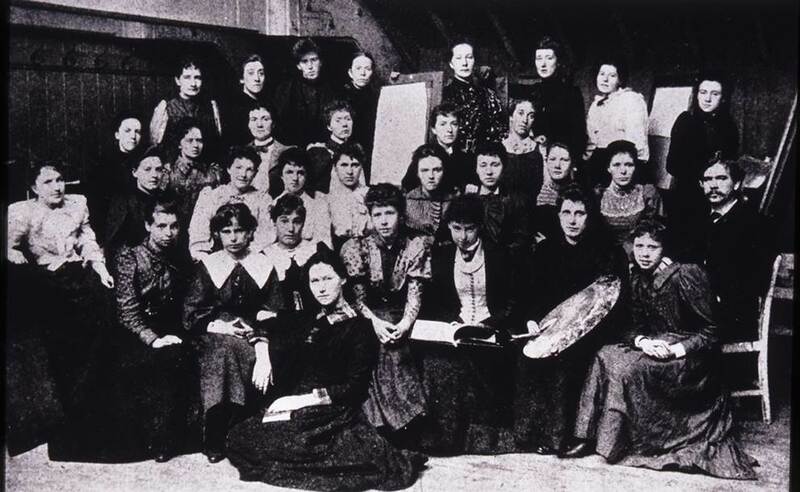 Jessie and Aniza appear in a photograph of female students at the Art School in 1894-95 (Picture 1). Aniza is standing behind Fra Newbery, (Head of the Art School and the only gentleman in the picture) and Jessie is the third lady on Fra Newbery’s left. This photograph may well look familiar. It often appears in books about Charles Rennie Mackintosh, as his wife and sister in law are amongst the students. Margaret MacDonald (Mackintosh) is in the front row, fourth from the right and her sister Frances MacDonald (MacNair) front row, first on the right. Another student in the photograph, Ella (Helen) Alexander, second from the left of the second back row, later had a studio on Bath Street almost next door to Jessie McGeehan’s studio. Ella was one of four talented sisters, three of whom attended the Art School; yet another example of the many groups of natal sisters who attended the School at that time. 2. 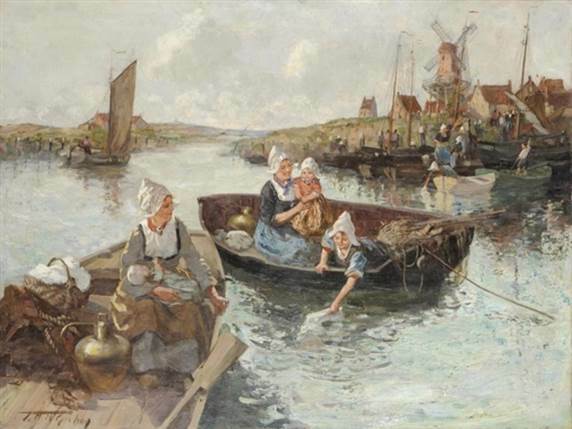 “A Dutch Washing Day” exhibited at the Royal Scottish Academy in 1914. Image courtesy of the-saleroom. Later in her career, she appears to have concentrated more on commissioned work and did not contribute to the major exhibitions, but in 1929, she had two oil paintings in the Walker Art Gallery Autumn Exhibition, one a portrait of her sister Aniza (Picture 3). At the same exhibition, Aniza showed a bronze bust of Jessie. 3. 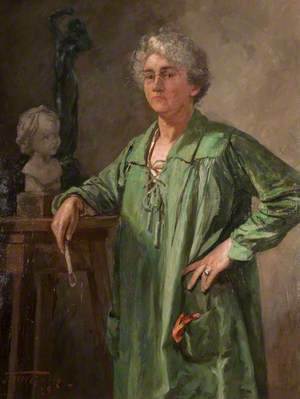 “Portrait of Aniza McGeehan” exhibited at Walker Art Gallery, Liverpool, 1929. Image courtesy of Art UK. 4. 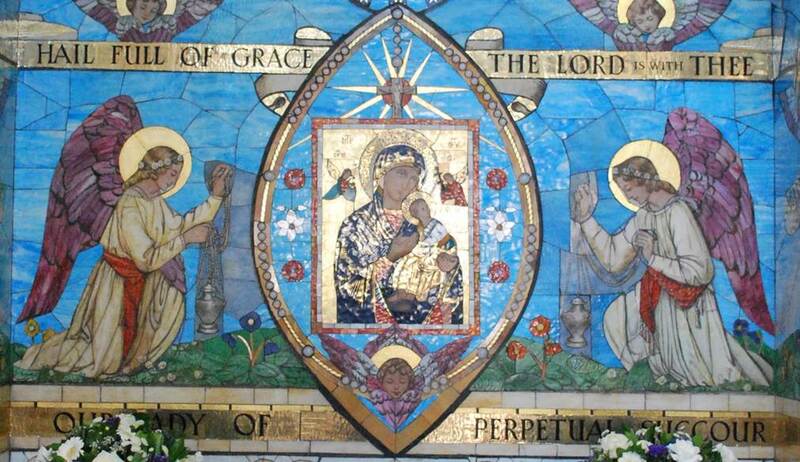 “Our Lady of Perpetual Succour” glass mosaic, St Augustine’s Church, Langloan, Coatbridge. Image courtesy of St Augustine’s Church, Monklands Heritage Society. By 1936, Jessie had moved to 152a Renfrew Street, which remained her studio and home for the rest of her life. In an advert that appeared in the Glasgow Observer in October 1936, Jessie was described as a Church Decorator and mention was made of mosaic fresco work and stained glass windows. An example of this strand of her work is the glass mosaic in St Augustine’s Church, Langloan, Coatbridge of Our Lady of Perpetual Succour (Picture 4). She also produced work for St Aloysius, Garnethill in Glasgow, the glass mosaic Stations of the Cross. Subscribe to our blog to learn the conclusion of the story!